The new Social Housing Fund is available to social housing providers and registered social landlords across Scotland to encourage and support active travel within communities. The fund, supported by the Scottish Government, will prioritise areas of high deprivation with the aim of encouraging walking and cycling for everyday journeys. 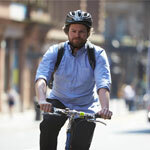 Cycling Scotland is working in partnership with the Scottish Federation of Housing Associations (SFHA), Living Streets Scotland and Sustrans Scotland. The new fund will improve facilities for walking and cycling, enabling residents, tenants and housing staff to enjoy their outside space and get active. Social housing providers can apply for grants of up to £25,000 for a range of infrastructure proposals including cycle parking shelters, street furniture such seating, litter bins, bollards and planters as well as improvements to access points and lighting. Social housing providers who are looking to actively promote walking and cycling options for residents. The fund will prioritise areas of high deprivation and properties that aim to encourage residents to incorporate walking and cycling as part of their daily journeys to and from work, to go shopping, attend appointments, and visit family and friends. Read the guidance pack which gives information about the fund criteria. If you have any questions, please contact socialhousingfund@cycling.scot or phone 0141 229 5350. Complete the application form and send to socialhousingfund@cycling.scot by 5pm on Friday 31st May.